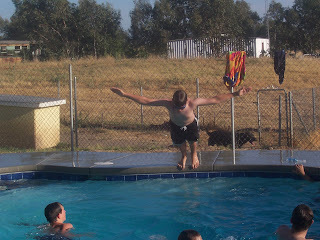 One of those bold belly flop moments for the record! Wear that reddened chest as a badge of honor, Connor! At Rod and Kim Lichti's home we enjoyed a day of sitting around talking, eating, swimming (the guys and their belly flop contests! ), volleyball, and even some rugby (Tim and the teenaged guys -- he dared to play with the young bucks and had a great time! They said, "We kept thinking, 'We can't hit him - he's the pastor' til HE hit US! ).